Let’s pretend, for just a moment, that you are snorkeling along a coral reef. Swimming along the surface watching the beautiful marine life below, you want to go deeper to take a close look. Holding your breath, you swim down to take a closer look at the fish playing amongst the coral. However, after a few short moments, it’s time to return to the surface. What if you could go deeper? Stay longer? That’s what Scuba diving is all about. SCUBA stands for Self Contained Underwater Breathing Apparatus. Scuba diving allows people to visit the underwater world without holding their breath. That’s what Scuba diving IS but it’s quite hard to explain the actual experience of scuba diving in words. I have heard many people say “It’s as close as I’m likely to get to being in outer space”, which i suppose is true. Weightlessly floating in mid water is probably as close to a Zero G experience as most people will ever get. However, it’s the sense of exploration that attracts me to Scuba diving. 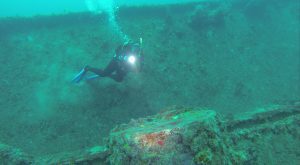 Finding interesting fish, exploring reefs, and my favorite, exploring shipwrecks. Exploration, seeing things few people ever get to see, thats what scuba diving is to me. In short, you need to be a strong swimmer and be ok with getting your face wet for long periods of time. PADI, the scuba agency I teach for, requires students to swim unassisted for 200 yards (any stroke) and float OR tread for 10 minutes. 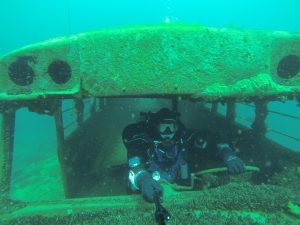 The initial learn to Scuba class through this agency is called “Open Water” and covers all the basics you will need to know to become a safe beginner diver. 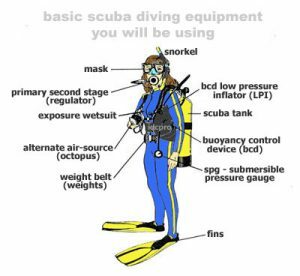 Some of these skills will require you to be comfortable swimming without a mask for a short time. If you want to practice this ahead of taking a scuba class, try snorkeling without a mask on. The sensation is very similar. Talk to your swimming instructor, they should be able to help you reach all of these goals. – Unless you are in the tropics with perfect conditions you are going to need exposure protection. Like a wetsuit or drysuit. Here is a nice diagram of where roughly where each of these items go. 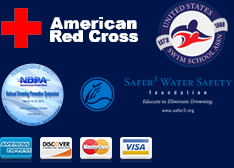 For more information on these items and other scuba gear I strongly recommend visiting https://www.padi.com/gear. Murphy’s Cove – Canada. About an hour away from Halifax, Canada is a tiny place called Murphy’s Cove. Beneath the waters of the shallow bay is a beautiful show of soft coral and brightly colored marine life like this neon blue starfish. Key Largo, Florida. This shipwreck is called the the USS Bibb. 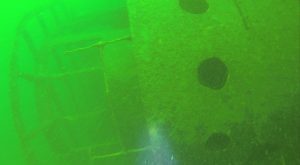 It was sunk on purpose as an artificial reef and now sports a beautiful collection of marine life. I like this photo in particular because it shows how red light becomes absorbed the deeper you get. That’s why the the patch where our lights are shining is red but everything else is blue or green. Saint Lawrence Seaway, Thousand Islands, Canada. This is a wreck called the Keystorm. While not the best visibility this wreck is cool because it sits nearly vertical with the front pointing up to the surface. This is a picture of “the Bridge” where all the steering equipment would be. Looks weird sideways right? Dutch Springs – Bethlehem, PA. Dutch Springs is an old limestone quarry that flooded and now is an amusement park for divers. 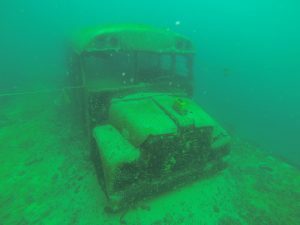 The owners of the quarry sink stuff there as attractions for divers. The park is close by and is great place to just hop in the water and have fun. Oh, and I decided to try and drive the bus 🙂 . Sadly it no longer works. In short, Scuba diving is all about adventure. It allows you to visit places few others have been. The experience is truly one of kind.